Subsequently, AzhwAr says “Will I see emperumAn who protects in all manner, both directly and through other agents?”. venRu pulan thurandha visumbALiyaik kANEnO? 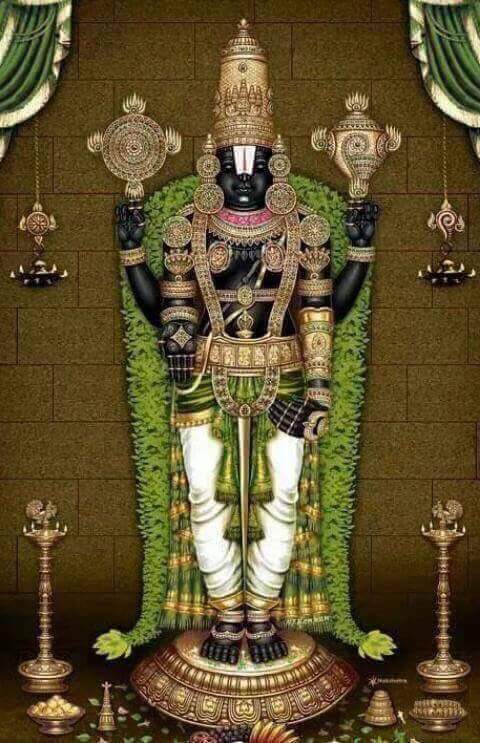 en thirumArban thannai – one who revealed to me his Sriya:pathithvam (being the divine consort of SrI mahAlakshmi) which highlights his lordship. kANEnO – will I not see? Will I not see emperumAn who revealed to me (a) his Sriya:pathithvam (being the divine consort of SrI mahAlakshmi) which highlights his lordship, (b) his having rudhra who has pArvathi in half of his body, as prakAra (form), (c) his having four-headed brahmA who has sarasvathi, the deity for tongue (knowledge) always as his confidential consort, (d) his having indhra [who is standing equally with brahmA and rudhra], the consort of sasI, as prakAra, (e) who lifted up the earth, who burnt down the three towns [as being the antharyAmi of rudhra], and who drove away and won over the senses [as being the antharyAmi of brahmA] and who protected by ruling the heaven [as being the antharyAmi of indhra]? Implies “I who am considering this seeing of emperumAn who is protector in all manner, as goal, am not seeing him!” eyil – fort, implying town inside the fort. en thiru mArban thannai – Here, “en” (my) is focussed on viSEshaNAmSam (attribute) [i.e., thiru is the attribute, and mArban is the entity]; as seen in thiruvAimozhi 7.2.9 “en thiru magaL sEr mArban“, here it means, one who has my lady lord periya pirAttiyAr in his divine chest. en malai magaL … – Starting here, “en” is focussed on the viSEshyam (emperumAn, the underlying entity of the dhEvathAs). Except to speak about them as his wealth, AzhwAr who remains as said in nAnmugan thiruvandhAdhi 68 “maRandhum puRam thozhA mAndhar” (those who don’t worship any one other than emperumAn), will not consider these dhEvathAs to be related to him [to identify them with some relation saying “my …”]. en malai magaL kURan thannai – emperumAn who has at his disposal, rudhra, who has the daughter of himavAn, pArvathi on one side of his body. enRum … – one who is the antharyAmi of four-headed brahmA who always has sarasvathi along with him. ninRa sasIpathiyai – one who is the antharyAmi of indhra, who is comparable in wealth, to be counted along rudhra and brahmA. One who is the antharyAmi of indhra, who is recited along in nArAyaNa sUktham as “sEndhra:” (he is indhra) while reciting “sa:brahmA sa:Siva:” (he is brahmA, he is rudhra) and is supported to stand along with them. What is the purpose of highlighting these? Previously, their true nature and greatness were at emperumAn’s disposal; here, as a father would find a suitable bride for his marriage-ready son et al, their wives were also granted by sarvESvaran only and not acquired on their own. nilam kINdu … – Further, it is explained that their activities too are at his disposal. nilam kINdu – Just as when mother earth became drowned into the ocean of deluge and became stuck to the wall of the oval shaped universe, emperumAn assumed the form of a mahAvarAha (great wild-boar), lifted her up and had total control over the situation, their [rudhra et al] activities are also under his full control. eyil mUnRu eriththa – One who burnt down three forts. It is said in mahAbhAratham karNa parvam “vishNur AthmA” (vishNu remained as the antharyAmi); that [act] was also at his disposal. venRu pulan thuRandha – One who won over the senses, as part of creation. One who drove away the senses, winning over them. visumbu ALiyai – One who fully rules svargam. (Here AzhwAr is reciting emperumAn along with the agents of this world to emphasise that since all actions are at his disposal, AzhwAr’s desire should also be fulfilled by him only). This entry was posted in thiruvAimozhi, thiruvAimozhi 7th centum on September 22, 2018 by Sarathy Thothathri.